Backglasses will arrive from Classic Playfield Reproductions during the week of December 12th. Because the run was even smaller than originally planned there will be very few available to the public, probably 25. Final cost with shipping now looks like around $200. Please contact Eli if you're interested in acquiring one. Pinball machines require a theme - some sort of basic story or idea to tie the art and gameplay together. In early machines this could be just about anything, a game of cards, a horse race, frolicking at the beach. However, since the middle of the 1980s the vast majority of commercial pinball machines have relied on a licensed theme. Whether it was a hit movie, television show, or sports franchise, the feeling was that players could only be enticed into expensive games on location if they could immediately relate the machine's theme to something familiar (and heavily advertised). In my opinion the artistic restrictions of licensed themes led directly to a significant decline in the quality of pinball art, even as the rules and mechanisms continued to advance. Since my own machine would never be required to earn quarters on location, I could give the art the attention it deserved. In fact, I was certain that the art I wanted was outside the reach of my own limited artistic skills. I needed an artist, hopefully local, whose work I enjoyed enough to build a massive project around, but who was neither so famous that the project would be impossibly expensive nor so commercial everything would need to be scheduled and planned months in advance. Fortunately, this artist actually existed, in the form of Seattle's resident mad genius - Jim Woodring. I had already met Jim briefly, so I knew he was approachable, his brilliant line work would be perfect for pinball, and Frank is one of the all-time great comic characters. I also knew Jim owned a pinball machine himself, since I had been to his house to pick up a sketch I had purchased. A run of about 40 backglasses was done by Classic Playfield Reproductions in late 2010. They are silkscreened onto tempered glass using the traditional process. The cabinet will be based on a late Williams cabinet (the basic design hasn't really changed in decades.) The cabinet will be spray painted using stencils, as was typical prior to the 1980s. The playfield design will be fairly simple, with more in common with late EM or early solid state designs than with the latest Stern release. It will feature three flippers, three pop bumpers, a drop target bank, and a captured "messenger" ball which can be released during play for multiball. There is a shot up through the pop bumpers, as found in many Pat Lawlor machines (my favorite designer, responsible for such classics as Funhouse, Addams Family, and Twilight Zone.) One feature of the playfield that actually is cutting edge will be the extensive use of color controlled rgb LEDs which will be used to combine shots into custom modes during play. The initial whitewood will be cut on my own basement CNC machine, a very early version of the kits available from Patrick Hood-Daniel at Build Your CNC. The Frank machine will use a mixture of Williams and Stern replacement parts, based on availability. Parts were sourced from a number of suppliers, primarily Pinball Life and Bay Area Amusements. The heart of the electronics is the P-ROC, a board created by Gerry Stellenberg at Pinball Controllers. The P-ROC provides an intelligent bridge between any computer with a USB port and a Williams or Stern driver board. The current plan is to use a Chumby Hacker Board to control the game logic. 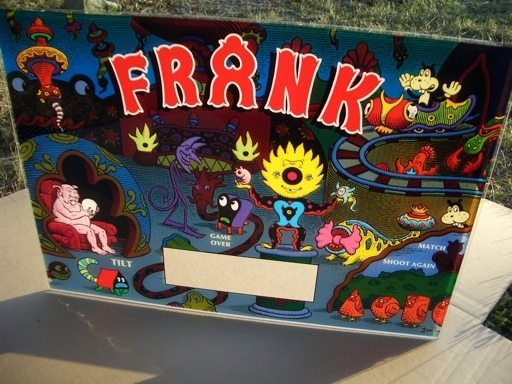 The P-ROC will support a pinball DMD, but the Frank machine will probably use an ultra wide car backup lcd instead. There is a low-level C library for communicating with the P-ROC, libpinproc, and Adam Preble has written a high-level game framework in Python, pyprocgame. I'm not a huge python fan, so I may write the high level logic in another scripting language such as Lua or just use C++. Finished source code will be available, either as public domain or under a permissive license.